Aerzener Maschinenfabrik, Aerzen, Germany, has recently introduced the concept of reactive silencers, which effectively reduce the noise emissions on the discharge side of its screw compressors, positive displacement blowers, and rotary lobe compressors. The innovative concept of these reactive silencers is said to be superior to classic dissipative silencers in many respects. The sound waves developing on the discharge side of a Delta Screw compressor made by AERZEN can reach 170 – 190 decibels. 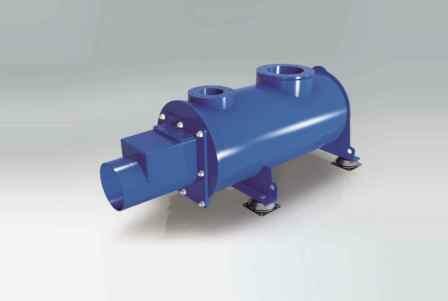 Therefore, a downstream silencer is obligatory, as is also the case with all standard compressors. The high frequencies of the sound waves lead to considerable vibration forces which have a damaging effect on the piping and the insulating material in conventional dissipative silencers. This leads to a reduction of the effectiveness of the silencer and to the erosion of very fine particles which contaminate the process air. Downstream filters have to be used, which lead to pressure losses, reduced efficiency levels, reduced energy efficiency and increased maintenance expenditure. With its patented reactive silencers AERZEN has not only neutralised the noise, but also the above mentioned problems. A special piping system generates a defined counter-noise, which superimposes the sound waves at a predetermined delay and thereby neutralises them. The concept has proved so effective that AERZEN now also equips its directly driven screw compressors with reactive silencers. The perfectly tuned modules do not wear, are maintenance-free and correspond to international standards PED and ASME.